New level of summer relax - inflatable beach cushion. Make your stay on the beach even better - check our offer full of trendy colors and prints and chose your favorite model! 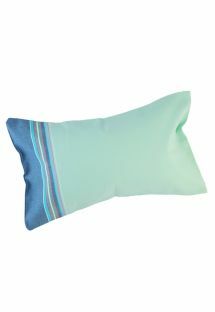 Inflatable beach cushions guarantee relaxation and comfortable rest on the beach. Everyone: children, women and men will love it! This extremely practical and functional beach accessory will work in many situations. They ensure the new quality of a holiday rest, not only on the beach, but also for example on the campsite. They might be even used on daily basis. 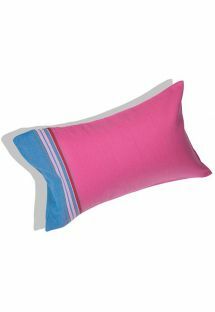 More and more manufacturers offer inflatable beach cushions in their summer accessories collection. 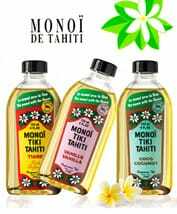 On the Brazilian Bikini Shop website you will find brands such as Simone et Georges and The Beach People. 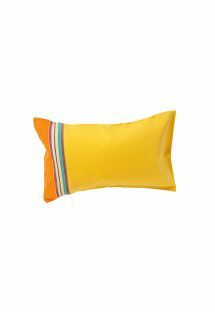 Simone et Georges inflatable beach cushions are inspired by the founders’ of the brand (who are siblings) stay in Kenya. 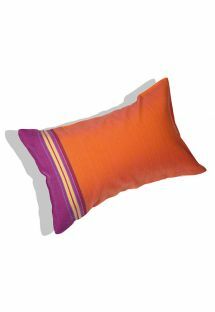 The pillows are covered with kikoy material, which is very popular in Africa and has many uses. 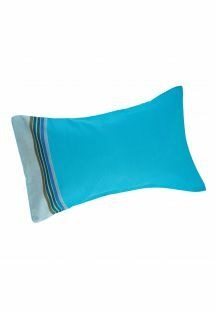 Pillows covered with this material are easy to keep clean because you can remove the case and simply wash. Kikoy is 100% cotton, while the inflatable inside of the pillow is made of plastic, durable material. 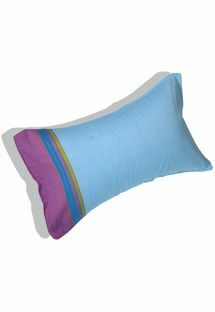 Simone et Georges pillows are 26x40cm and can be washed in a 30° in the washing machine. There is plenty of colors and patterns, everyone will find something for themselves. 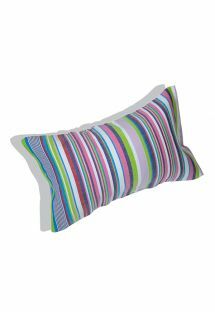 The patterns are quite varied, from very natural to striped and more eye-catching prints. 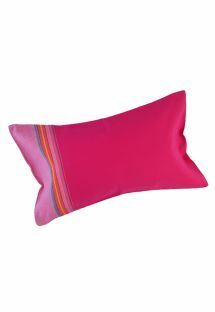 The manufacturer guarantees the improvement of a beach nap if you use the cushions. 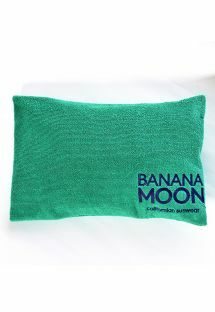 What is more, small pouches in which the cushions are packed makes it easy to take them comfortably anywhere you want. 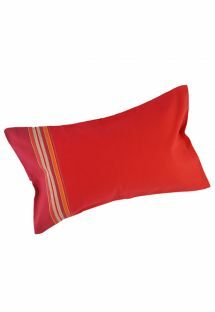 The Beach People brand offers a slightly different size of the cushions i.e. 51x26 cm in colors inspired by sky and earth. 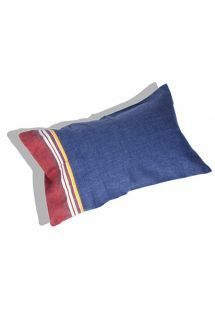 The cushions are double-sided, each side has a different pattern, the zipper is fastened and the cushions are made of 100% cotton. You can also wash them easily in the washing machine. 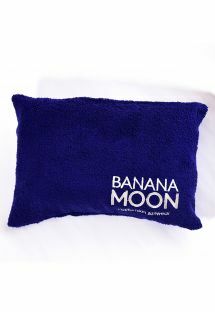 They are packed in a comfortable sachet that can be used in many ways. We are constantly expanding our offer so visit us often and check out what's new for you. Check out the Brazilian Bikini Shop and find the perfect inflatable beach cushion for yourself. Inflatable beach cushions are an essencial element on the beach if you love to sunbathe and lean your head comfortably. Beach pillows in the Brazilian Bikini Shop offer have many advantages. Firstly they are inflated, which means that you can bring them to the beach folded - they will not take up much space in your bag. Secondly, you can inflate them as much as you want - depending on what you like and need at the moment. What's more, the inflatable beach cushions have a removable case, easy to wash, so it will always stay clean. 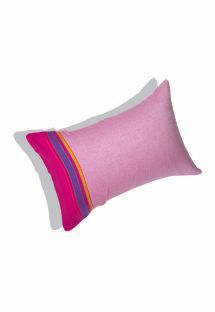 Last but not least, the pillows are packed into beautiful pouches that you can use in many ways. More and more producers such as Simone et Georges and The Brach People have inflatable beach cushions in their offer. 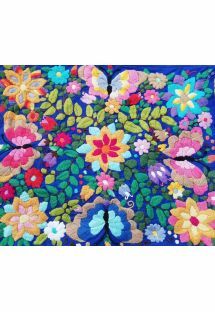 Materials are of a very high quality, vibrant colors and patterns do not blank in the sun. 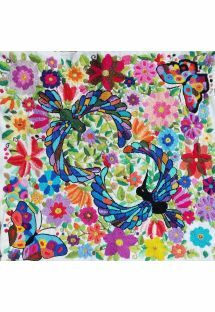 There is so many patterns and prints that everyone, both women and men of any age, will find something for themselves.